The corrugator is the largest and most expensive machine in the corrugated manufacturing process. It is about the length of a football field and can cost several million dollars. The corrugator combines rolls of linerboard and medium into sheets of corrugated board. The typical corrugator is equipped to run both single wall and double wall in a variety of flute heights. Modern machines can also be equipped with innovative enhancements that offer a range of value added features such as functional coatings, color coating, tear tape or internal strings, and water resistant adhesives. Advanced technology such as razor cutting knives and robotic scoring heads allow the machine to produce quality board with faster set ups and shorter cut offs. Slitter-scores and cuts corrugated board. Most sheet feeders and corrugator plants do not have slitters. Most sheet plants use slitters to run quick turnaround jobs out of stock. The slitter cuts stock sheets down to the specified width and adds horizontal scoring. Slitters are also the go to machine for slit or knife scored products. Printer-Slotter-prints, slots, and adds vertical scores to the blank. Blanks are then taken to a finishing machine to be joined. Machines vary as to the number of print sections and type of printing. Also some are more versatile than others with capabilities such as side slotting and the ability to handle die cut attachments. Semi-automatic Taper/Gluer-joins the scored and slotted blanks to form the finished box. Reinforced tape 2" or 3" wide is used to join taped boxes and either a cold or hot melt glue is used to glue boxes together. 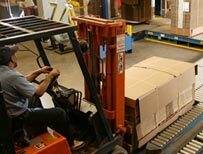 Boxes are hand fed through the machine then bundled and/or stacked and unitized for delivery. Semi-automatic Stitcher-joins the scored and slotted blanks with stitching wire to form the finished box. Boxes are hand fed through the machine then bundled and/or stacked and unitized for delivery. Folder-gluer-joins scored and slotted boxes together automatically. Blanks are stacked on a feed table and are fed through a folding and gluing section. Boxes are counted, bundled, and ejected then unitized for delivery. Folder-gluers vary in size limitations and capabilities. Flexo folder-gluer-prints, scores, slots, and joins boxes. It is a one-stop operation for many straight lined styles. Machines vary as to the number of print sections. Also some are more versatile than others with feed section enhancements, printing options, die cut sections, and speed capabilities. Flatbed die cutter-die cuts corrugated blanks. There is a range of flatbed die cutting machines. Most are either inexpensive or expensive. There is not a lot in between. Most of the inexpensive equipment is semi automatic, labor intensive, and slow. The expensive equipment is high speed and is able to print, die cut, and strip die cut blanks. The cutting dies are flat steel rule dies versus rotary. Machines vary in size and options. Rotary die cutter-die cuts corrugated blanks with steel rule dies that are mounted to a cylinder on the machine. A workhorse in most corrugated plants. Machines vary as to number of print sections. Also vary in size and options. Labeler-applies lithographic labels to blanks for enhanced graphics. Blanks are then run through another machine to be finished. Machines vary considerably in size, speed, and options. Specialty folder-gluer-offers value added gluing such as corner glued trays and lock bottom boxes. Machines have advanced folding technology and the ability the apply glue in several places. Machines vary in size and options. Laminator-glues several layers of blanks together. Built up products offer greater strength and are primarily used in protective packaging.